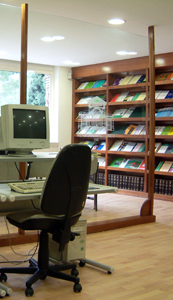 The Historical Archive and Library are two research support units reporting to the office of the director of the Real Jardín Botánico. They comprise Spain's most important scientific library and archive of historical documentation on the subject of plant life. Its collections contain incunnabulae and historical materials of incalculable value from the 17th and 18th century, electronic resources and online databases, with access to the most recent publications in botany and horticulture. The library's holdings specialise in everything to do with botany. They comprise 34,000 books and 2,094 periodicals, ranging from classical botanical works through to more recent studies of taxonomy, floristics, and general and applied botany. (Go to: Library).